Renovating can be a tricky business in many of Toronto’s older neighbourhoods where mere inches separate some houses. Say you have to caulk windows or fireproof a sidewall as part of a job you’re doing for a client, and there’s no way to do it without putting a ladder or scaffolding on the neighbour’s property—but the neighbour refuses to grant access or even allow a crane to swing over his yard. In situations like that, Brendan Charters, partner in Eurodale Developments, a Toronto renovation and custom home building company, relies on the relationships he’s built with City of Toronto officials to gain a Right-of-Entry permit to an adjoining property so his crew can finish the job. Whereas past relationships renovators and builders had with building officials were often tenuous and contentious, that’s changing due to an increasingly complex construction environment and a rapidly changing Ontario Building Code. But navigating the process remains a particularly daunting task for renovators, who have to deal with issues such as tying new construction to older houses, protection of trees or heritage properties and dealing with unhappy neighbours. And that’s why renovators and builders should be forging alliances with their local officials, suggest Charters and others. “We are coming out of an old era of adversarial relationships—one that is going away rapidly as everything is becoming more complicated,” says Garnet Northey, president of the Peterborough & The Kawarthas Home Builders’ Association and owner of Spotlight Home and Lifestyle, a renovation and restoration company. “Our interests aren’t divergent; they are convergent. We are on the same page,” agrees Jon-Carlos Tsilfidis, Renovator Council chair for the Building Industry and Land Development Association and president of Fairside Homes, a company that does renovations and new home builds. Doug Tarry is another who appreciates the value of walking in step with community officials. While president of OHBA in 2011, the director of marketing for Doug Tarry Homes was a catalyst in forging a working relationship between the Ontario Building Officials Association and OHBA, similar to a working committee he had been co-chair of in St. Thomas that included builders and building officials. Tarry says builders had felt like they had had “the rug pulled out from under them” when building officials got advance notice of Code changes before them, then they’d scramble to comply and get their houses passed. The Molinaro Group, which builds extensively in Burlington and has been a trailblazer in introducing concepts not previously seen in the city, such as downtown mixed-use residential condos, also recognizes the value of such ties. 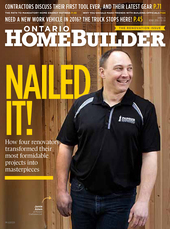 Company president and OHBA Past President Vince Molinaro says fostering such bonds has been imperative in mounting projects, as well as getting them built in a timely manner. A dozen years ago, his company purchased an old gas station site to redevelop as a mixed-use condominium (Bunton’s Wharf). Although the site itself had been remediated, off-site contamination was discovered midway through the construction process. “We had to scramble—get road-closure permits, get the area excavated and peer reviewed,” recalls Molinaro. A series of meetings between both Molinaro’s and the City’s experts and consultants were held to figure out how they could tackle the problem. Although it was a serious issue, by working collaboratively the issue was resolved and construction was able to continue with as little delay as possible. “The City respected the fact that instead of complaining about it, we worked with them to resolve the issue and demonstrated to them that we were a true team player,” says Molinaro. “It wasn’t easy at first,” acknowledges Findlay. “The issues that are a bit challenging between the sectors get thrown on the floor and beat up pretty harshly: ‘Why do you do things differently? Why can’t you be on the same page?’ But eventually everyone realized the challenges that faced each other and there was a better understanding. “I remember sitting down with OHBA CEO Joe Vaccaro and getting a better understanding of the higher level items on the table,” says Findlay, a former OBOA president. “One of those issues was how municipal building departments are on different pages as far as the Ontario Building Code is concerned. I don’t think we as building officials recognized that until our partners went to great lengths to point it out to us. “When you have a good working relationship with someone and there’s mutual respect, you’re probably going to have a better understanding of their needs and know what the source of the issue is quicker,” Findlay adds. “Even if you don’t get along, try to understand what each other’s jobs and issues are. I spend a lot of time telling people that the City of Peterborough didn’t invent the OBC and all the requirements for submission. You’ve got a group of people here who are simply trying to do their jobs. You may not like it, but if you at least respect it, things are probably going to go well. The one thing I really appreciate about Garnet is his open and honest approach. It’s gotten to the point now that we can go downtown and have a coffee and if he passes on a complaint to me, I know that it has been vetted and I’ll take immediate action on that based on faith. Those are the intangibles in a good relationship. Findlay also recognizes the importance of the building industry in Ontario and Peterborough. “We have to work together. I’m a law enforcement person—we enforce the building code—but my mayor and the CEO on my council also expect my department to help the construction industry succeed. But we all have to take responsibility for our profession. 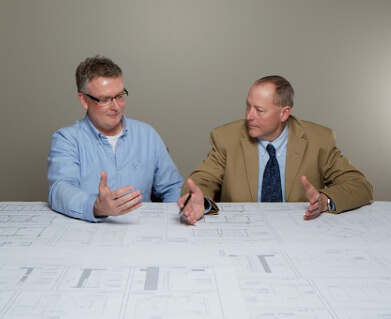 As building officials, we had to become more educated in the technical aspects of the OBC to better understand our core work. Similarly, for builders, the more they know about the OBC and their obligations, the better they’re going to do. LeBlanc adds that building departments are reaching out more to builders and renovators, such as experimenting with service hours and offering advance reviews of plans to provide some coaching to make sure submissions will be correct. The City of Hamilton has also nurtured the process by implementing awards for best applicants to recognize exemplary builders and renovators who invest time and effort to avoid problems. (Winners have included OHBA members Spallacci Homes in 2013 with the Building Inspection Recognition of Excellence Award, and Marz Homes in 2015 with the Building Permit Submission Recognition of Excellence Award). What remains a source of frustration for renovators is the unpredictability of how long a permit will take. Generally, the process can be a little quicker in smaller municipalities but gets more complicated in large cities such as Toronto or Ottawa. In Toronto, Charters says permits can be fast-tracked in as few as five days for projects that aren’t complex or for additions of less than 1,000 square feet, although the zoning has to be clear. But often a renovator won’t know if zoning is clear until he seeks a zoning certificate, and that review process can take up to 12 weeks. Charters says he’s had permits take as long as eight months. Complex projects may have to be reviewed by many departments (such as planning, building, transportation, zoning and urban forestry). If it’s on a ravine property, it will require Toronto Region Conservation Authority approval, and historic properties may need heritage approval. Sometimes an application will come back with comments conflicting with those from other departments, Charters adds. “Municipalities are making great progress on providing better service, but what remains a bottleneck is the permit process. It is still a major instrument of broad public policy, and real friction remains,” LeBlanc agrees. Northey would like to see inspectors in his area designated as experts in specific areas such as framing, plumbing, HVAC, etc. Those experts could do the inspections for their field of expertise across all the local municipalities. He says it may also be worthwhile to have separate inspectors for new home projects and renovations. A bone of contention for Charters and other renovators who work in Toronto is that it is the only municipality in Ontario or Quebec that doesn’t furnish inspection reports containing details of whether a project passed or why it failed. With no proof of inspection, that’s a potential liability for a contractor. Time-challenged workweeks, though, leave little time for building relationships, Charters laments. The renovation industry in Ontario and the GTA is larger than the new-home industry, and so much more segmented, says Charters, with thousands of renovators, many of them small mom-and-pop operations that don’t have the staff or internal structure to deal with municipalities. “I have to run every day to get permits and sell jobs and deal with on-site issues and I have very little time to saunter into building departments and spend a couple of hours a week to develop relationships,” Charters says. But if you don’t do that, you’re just a single file on the books, he adds, and the odds are the people across the counter don’t know—or care—who you are. What he and Tsilfidis suggest is for renovators to join their local home builders’ association. “With the myriad Code changes happening, especially regarding energy efficiency and insulation, it would behoove renovators to become members of their local home builder association, as those associations provide education courses and updates,” says Tsilfidis.